Keep your pets safe during fall yard work! TurfMutt shares tips on helping your pets stay safe during fall yard work! Fall is in the air and leaves, leaves and more leaves are in the yard. With the change of the season comes more yard work and when you venture out with your garden gloves, boots, leaf blowers, hedge clippers and mowers – your furry friends may be right at your heals. Make sure you and your pets are safe as you tidy up your outdoor space this fall with these yard care safety tips. 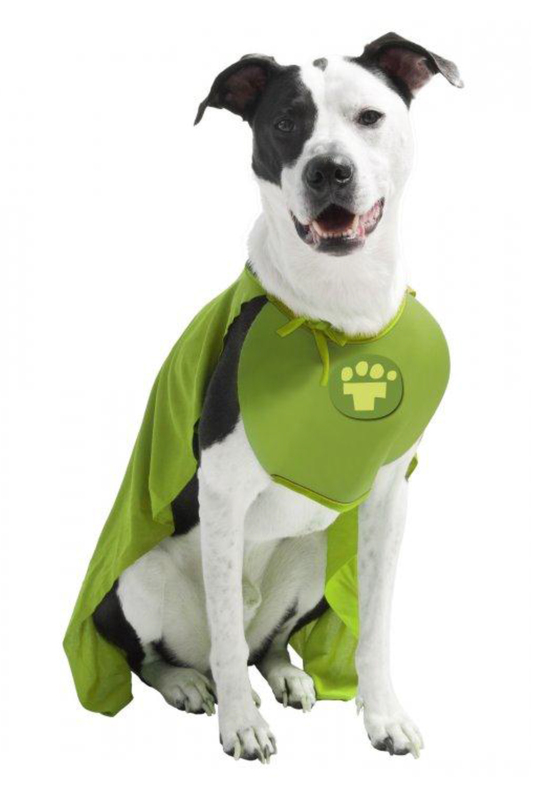 Lucky the TurfMutt provides information on safe and eco-friendly backyards. Learn how Lucky became TurfMutt in his Happy Tail. Make sure pets are out of the immediate vicinity of the area where you’re about to use a leaf blower or a mower and keep pets off riding mowers. Remove stones, sticks and other objects from the area before you begin your work to avoid flying debris and, for that matter, make sure all pet toys, bones and leashes are out of the way, too, to protect you and the health of your mower. Never leave a mower or electric tool running unattended. If you must leave for any reason, turn the mower/electric tool off and unplugged. Raking leaves is a wonderful, safe and natural alternative and a good way to get some exercise while you’re at it. The first thing to do when thinking about planting or even rejuvenating your lawn is to determine which type of grass seed works best in your climate. Each type of grass has different water, sun and temperature needs. Choosing the right grass is a natural way to keep your lawn healthy! Check out WebMD’s lawn care article for more information. To find out what types of grasses do best in your area, check out TurfMutt.com to find your region and explore your local eco-system. When you take care of a new or existing lawn, it’s important to know that your lawn would be happy with no more than one dose of fertilizer a year. This is best for the lawn, your pet, the environment and your wallet. Top-dress with a quarter- to a half-inch of compost or consider fertilizer that’s labeled “slow release” or “natural organic” fertilizer. Grass recycling is a great alternative to chemical fertilization and an overall green and efficient lawn care technique. Grass clippings are 75% to 85% water. When you mow regularly, grass clippings quickly decompose and release moisture and nutrients to fertilize the lawn. Think about the time you’ll save (and garbage bags) by not bagging your clippings! Learn more at Paw-Rescue.org! Watering the lawn before and after applying fertilizers helps break down the chemicals making them less potent and significantly less harmful to those who come in contact with them, according to Paw-Rescue.org. Always remember to store lawn and other potentially poisonous products in areas up and away from your pets. Check the fence. If you have a fence around your yard, now is a good time to look it over before the dark days of winter. Walk the perimeter of the fence for any gaps, loose boards or unsteady ground posts. Many local home improvement centers, such as Home Depot offer advice online on how to maintain and fix your fences. For more great safety tips for you and your pet family visit TurfMutt.com. Learn how Lucky became TurfMutt with a mission to “Save the Planet One Yard at a Time” in his Happy Tail. Otherwise we hope you and your pets enjoy jumping into big piles of leaves this fall!